Once upon a long time ago, Thrustmaster used to be a name that we would associate with cheap controllers. Those days are gone and they now have a line of premium products as well as value products for every gamer. The big thing they were showing off this year at CES is the finalized T500 RS wheel for the Playstation 3. This has be licensed from Ferrari and is the most realistic racing wheel that money can buy. Speaking of money, you'll need a bundle as it lists for $600. With that in mind I sat down and nearly had my thumbs ripped off when I crashed through a board fence and hit the ditch in Grand Turismo. Their other premium controller is the HOTAS Warthog controller and this thing is incredible. I'm more of a flight simulator kind of guy rather than a racing simulator guy and I love the Warthog. It is heavy, solid construction and features mechanical switches to boot. It's top end and will cost you dearly, but if you're into realistic flying games and simulators, it is the way to go. 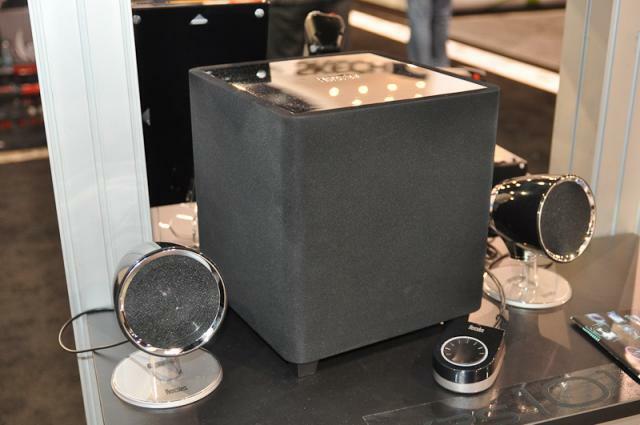 Hercules this year was showing off their new XPS 101 speakers. These are the best speakers that Hercules has ever made and feature 3 6" drivers in the bass unit. One of these is powered and the other two are passive but the result is pretty good. The small satellites seem to balance quite nicely, although listening to them in North Hall of the LVCC is not a great place to get a good impression. Please post any thoughts, comments and questions you have at the "Comments" link below. Also, make sure to check out our other CES coverage over here, as well as all of our Day 2 pictures in the gallery here.